This entry was posted on Monday, January 24th, 2011 at 7:01 am and is filed under gag cartoons, gags, holidays, love, relationships. You can follow any responses to this entry through the RSS 2.0 feed. You can leave a response, or trackback from your own site. Thanks for introducing me to the photography of Vivian Maier. I enjoyed them and recommend putting the Asleep in Public Places to music. I particularly liked the one of the young bathing beauty on a blanket with what looks like an ominous fedora peering over her blanket. Truman Capote? I also liked your Valentine’s cartoon. Very appropriate to have a new category: friend with benefits. I want to thank you, Jim, for bringing Vivian, shy and unassuming but so vivid in her reaching out with her camera and her life . . . as you describe it, where 3 she helped grew up and helped her survive . . . the miracle of each individual brings us together . . . we need the children, and the sleepy ones on our streets, in our lives . . . we thank you, and of course, Vivian . . . Bev. So nice to hear from you, Bev. Hope all is well with you and Ernie . . . and thanks for the kind words about Vivian Maier’s work. She’s wonderful. Thanks for the comment, Susan, and glad you liked the cartoon. 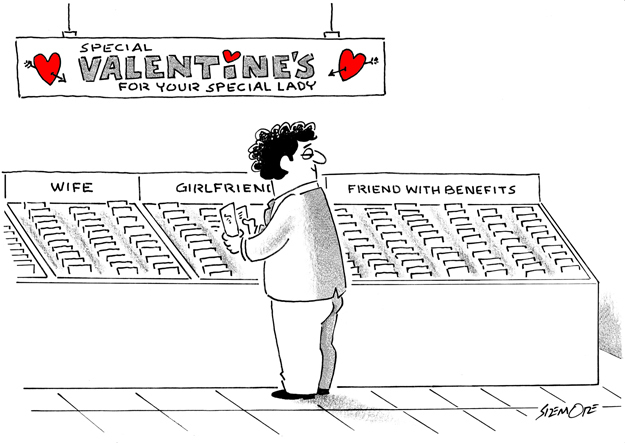 I’m doing a series of five or six cartoons for Valentine’s Day. The next one is scheduled to post this coming Monday, assuming I get to my drawing board before too long . . . I love that photograph, too, and it does look like it could be Capote. But as I mention in my caption, the mysterious shadow is Vivian Maier herself. According to one of the boys she cared for, she liked to wear various articles of men’s clothing, including hats and shoes.